Today we are meeting the city of Canton. We’ve traveled extensively through Ohio but somehow never managed to visit this city. When you hear Canton the first thing you think of is the Pro Football Hall of Fame, we’ll get to that. 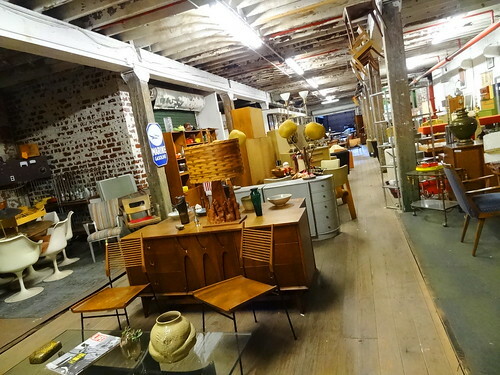 First we’re going to dig into the city, explore what makes Canton unique. 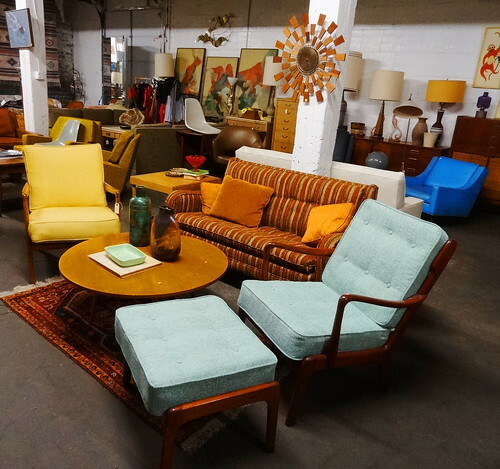 Kris came across the name of a shop claiming to be Ohio’s largest dealer selling Mid-Century Modern furniture and decorative arts; Main St Modern, here we come! We come into the city from the west and the south, we’re in an old industrial area; train tracks, abandoned buildings, empty lots. An ancient brown brick structure looms ahead, we’ve arrived. The building is huge, 40,000 sq. ft, windows have been boarded up, Rebecca greets us as we enter the building. I look from one side to the other, a blur of color, cool shapes and designs fill my view as far as I can see; there are three floors to explore. I’m guessing this is an old factory, paint peels off exposed rafters, the wood floor creeks under our feet. 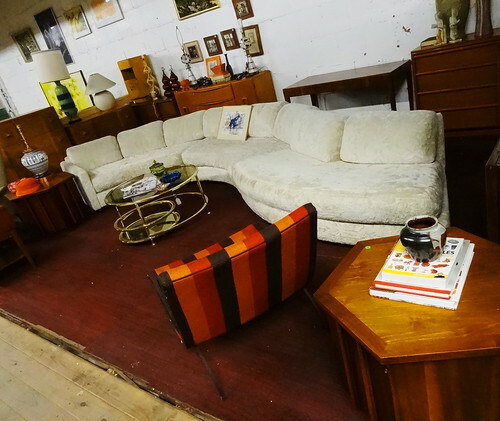 Individual pieces and vignettes of living and dining rooms are set up on carpet remnants; well-known brands share floor space with knock-offs. 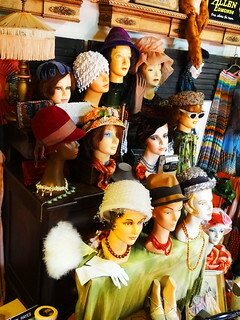 There are so many outstanding pieces, fabrics with funky designs, stripes and colors. 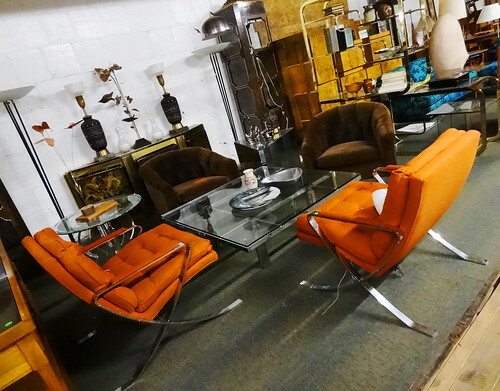 Tables and chairs are trimmed out in chrome, glass tabletops are available for a dining room or coffee table, the legs are always interesting too. 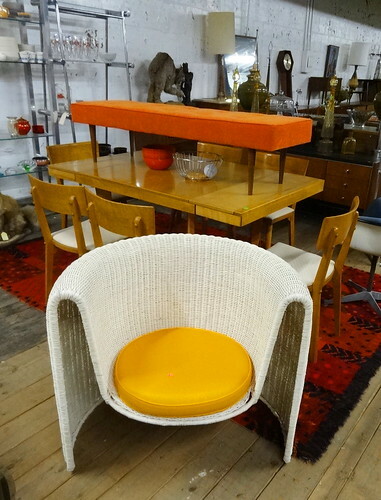 Plastic was popular in the 1960’s and 70’s, I like the brown circular chairs with the orange cushions. 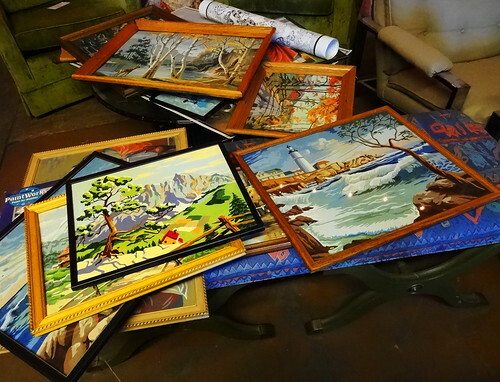 Items are stacked one upon the other, vases and other decorative items rest on dressers, buffets and china cabinets; we look through stacks of vintage paint-by-numbers. 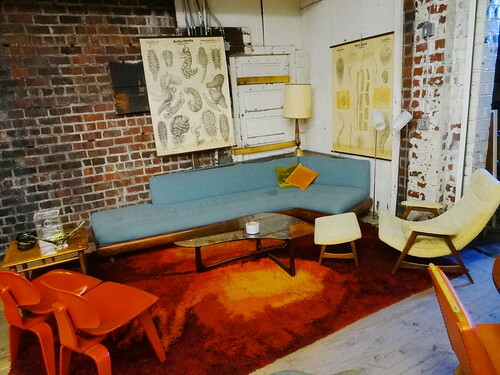 Chairs hang from beams, bicycles are mounted on a wall, lamps are abundant, couches are everywhere. 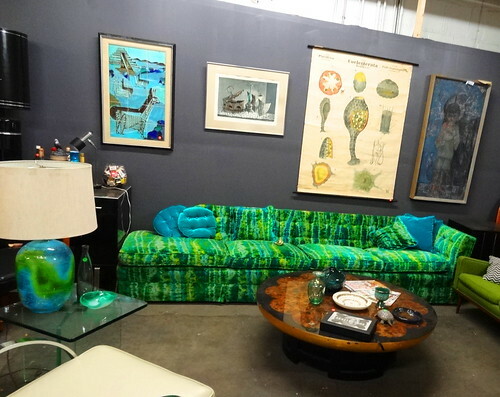 Chairs are made of smoky lucite, bar carts hold cocktail shakers, furniture is odd-shaped, we’ve always liked large pieces of metal wall art. 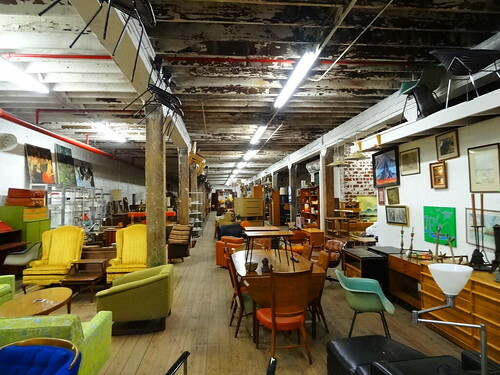 We’ve covered all three floors, sadly we’re not bringing anything home but it’s been fun going back in time to the days of shag rugs, tulip chairs and chrome. Were heading downtown where we’ve got lots more to see. 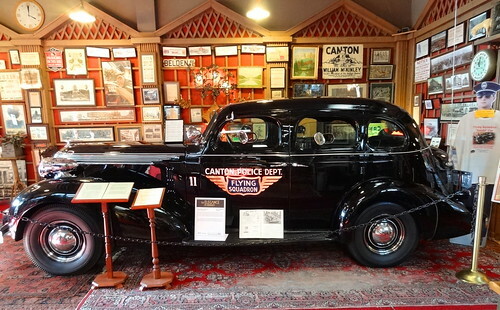 The Canton Classic Car Museum is much more than a simple car museum, it’s more like a tribute to all things Canton. 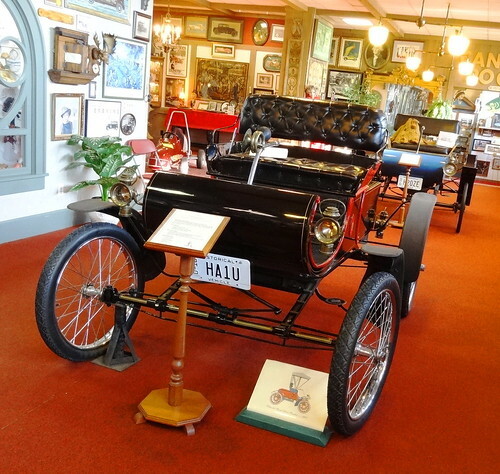 Marshall Belden was the great-nephew of President William McKinley, this building holds Belden’s classic and special interest autos and thousands of pieces of historical memorabilia he and his wife collected throughout their lives. 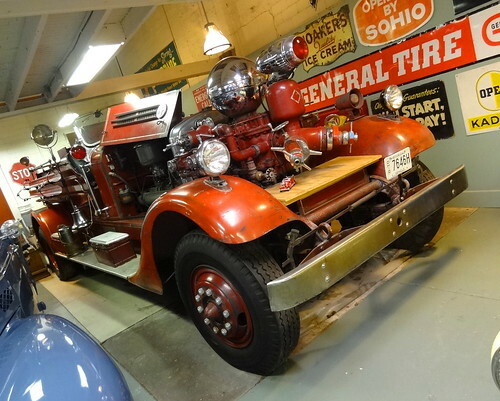 From Tonka trucks and Hot Wheels to fabulous fashions, vintage advertising and political memorabilia, this place is fascinating! 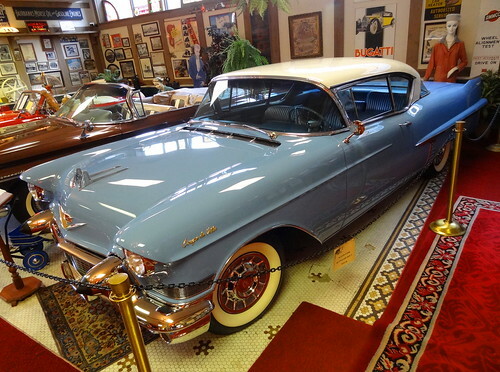 Just inside the door we are greeted by a 1901 Oldsmobile with the famous curved dash, historic photos and memorabilia cover every inch of wall space, antique light fixtures illuminate the room, there’s so much to look at. The building was built in 1900 by George Monnot as a bicycle shop that also sold Indian Motorcycles. 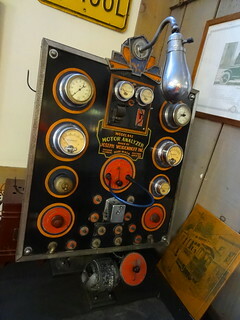 With the Lincoln Highway just 6 blocks away he turned the building into a 24-hour auto repair shop. In 1914 Monnot decided to sell Ford Model T’s; unable to afford complete cars he and Henry Ford agreed to send parts by train which Monnot’s employees would assemble by hand then place on the showroom floor. This was the largest Ford dealership from 1914-1931–who knew? Walking slowly we make our way to the Canton Room, a 1937 Studebaker bullet-proof police car takes center stage, back in the 1920’s and 30’s gang violence, racketeering and bootlegging was commonplace; they say sightings of John Dillenger, Pretty Boy Floyd and Ma Barker’s Gang were not unusual. 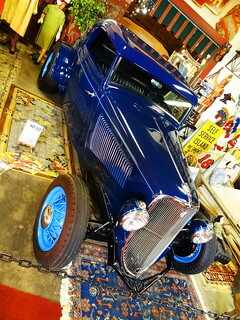 The vehicle has 1-inch-thick bullet-resistant glass with a closeable Tommy gun porthole. We read that at one time Canton was a manufacturing powerhouse; home to the Hoover Vacuum Cleaner Company, Tiemken Steel, Belden Brick and Diebold– maker of bank vaults, electronic voting devices and ATM’s, which is still located here. 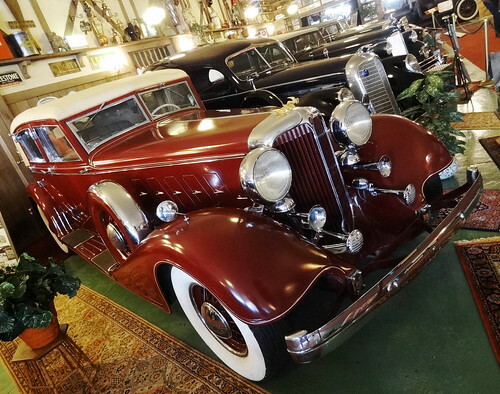 Vehicles intermingle with Oriental rugs, historic photographs, nostalgic pieces from Meyer’s Lake Park, elegant ladies’ hats and gloves. 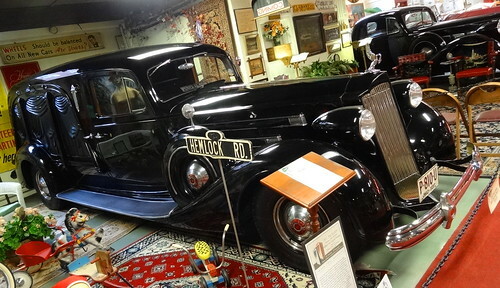 The 1937 Packard Hearse has hand-carved mahogany body panels. 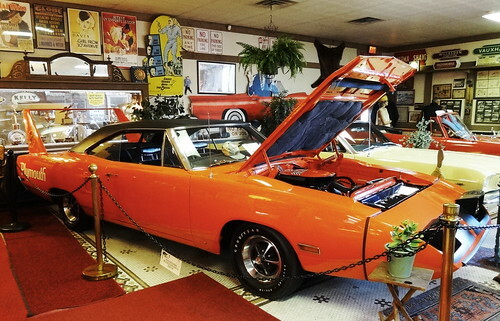 An orange 1970 Plymouth Superbird is parked on the original tile floor. 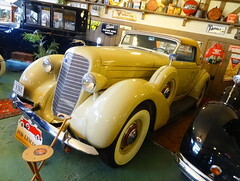 They have a Bonneville, a Coupe de Ville, a 1937 Cord, an original 1937 Ahrens-Fox Quad fire truck and Walter P Chrysler’s swanky burgundy 1932 custom Chrysler Imperial. 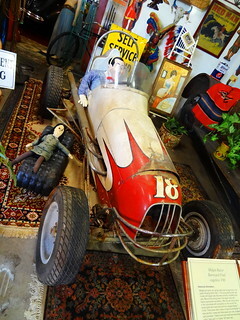 In another area a Pee Wee Herman doll drives a Midget race car, a grouping of coin-operated machines can do everything from telling your horoscope to showing a movie, a traffic light is a must in a car museum.